Rooted solidly in the Anabaptist understanding of faith, we seek to follow Jesus Christ both as Savior and Lord; believing his life, death and teachings model for us both faith and contemporary discipleship. We are a multi-cultural congregation integrating both English and Spanish in our services and ministries. 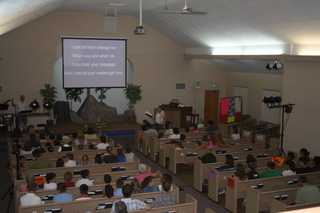 In addition to music and scripture being offered in both languages, sermons are simultaneously translated into Spanish. For those unfamiliar with English, "Classe de los Amigos" offers an adult Spanish Sunday School study. From its beginning, North Goshen Mennonite Church has been established for outreach to witness to the love of Jesus Christ in very down-to-earth ways in our community and around the world. On the third Wednesday night of each month, we celebrate a "Community Meal" in which the entire neighborhood is invited. From our summer community "Block Party" which attracts many local residents of all ages to offering weeknight classes for learning English, we try to make our faith evident in concrete ways. In addition to regular scheduled Sunday School for all ages at 9:00 A.M. and Sunday Worship at 10:15 A.M., we have a lively Youth Group for High School youth on Wednesday nights and "Venture Club" activities for Elementary and Junior High ages. Our church is a safe haven for all those who enter. A Safe Sanctuary Policy has been implemented to ensure each one is nurtured and cared for in a protective environment. If you have any questions or would like to visit with one of the pastoral staff, please contact us.